Double Post– Who Are You? Hey everyone…sorry I was not able to post on Friday. I had a lot of class work, and then an idea came to mind. I went to a masquerade party at my church, and since the student ministry is focusing on identity this month, I thought it would be awesome to do a double post on identity as well! So now you will get to see my dress and homemade mask that I wore to the party. Again, sorry I did not give warning about this double post. It was a spontaneous sort of thing, and I was busy getting ready for it. This week’s going to be another busy one, but spring break is right around the corner now! Therefore if any man be in Christ, he is a new creature: old things are passed away; behold, all things are become new (2 Corinthians 5:17 KJV). We are new creatures in Christ! If you’ve given your heart to the Lord, then you have been cleansed of your old life and have been given a new heart! All of your past shame and guilt is now broken. You have been forgiven and redeemed. It’s now time to embrace the freedom of Jesus and start living for Him! This is my dress that I wore to the masquerade. It has a white tulle skirt and gold sequins. I wore white ballet tights for warmth and modesty. And better still? The shrug was thrifted! This was my mask before it was finished. 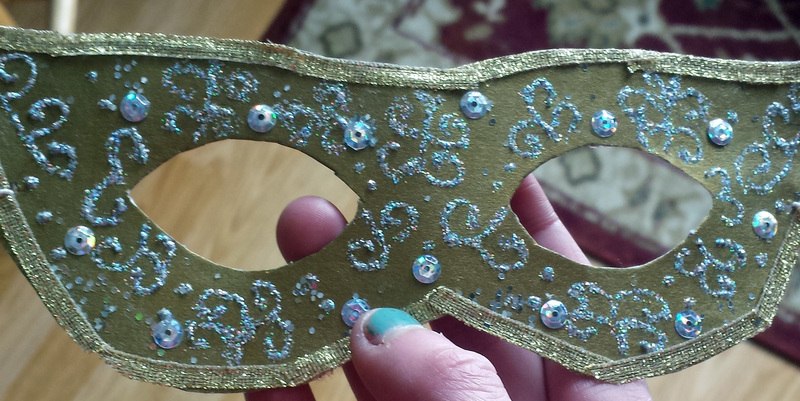 I used a template and made the mask out of gold poster board. The design is made of silver glitter glue. And this is the finished mask! I went over the glitter glue and then added sequins and trim. It took a while, but I was quite happy with the results. I will praise thee; for I am fearfully and wonderfully made: marvellous are thy works; and that my soul knoweth right well (Psalm 139:14). This quote is the inspiration for the name of my blog, and it’s where I am reminded of my confidence and definition of beauty. God made me and you, and trust me, He does not make mistakes. God created you with His own hands, knowing exactly how you would be before you were even born– before anyone even knew you existed. You matter to God, and that is enough. He loves you more than anyone else ever could; He gave Himself to die through His Son Jesus for you. Every child of God is loved and given a purpose, and no one else can fulfill you the way He can.